The watchdog's analysis shows the number of graduates being awarded first and upper-second class degrees rose from 67% in 2010-11 to 78% in 2016-17. The OfS says the rise was "unexplained" and could not be fully put down to other factors, such as background, prior attainment and improved teaching. It says that in 2016-17, a total of 77 universities in England showed a statistically significant unexplained increase in first-class degree awards - this was in relation to both other universities and to their own level of firsts given in 2010-11. Ms Dandridge said it was important for students, graduates and employers that degrees held their value and that "spiralling grade inflation" undermined public confidence. "This report shows starkly that there has been significant and unexplained grade inflation since 2010-11," she said. "We absolutely recognise how hard students work for their degrees, and accept that improved teaching and student support, and increases in the qualifications students gain before university, could explain some of the increase in grades. "However, even accounting for prior attainment and student demographics, we still find significant unexplained grade inflation." 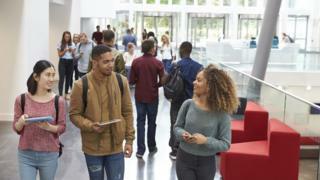 Alistair Jarvis, chief executive of Universities UK, said: "Universities are already taking steps to tackle grade inflation. "The report we recently published outlines a number of measures to protect the value of qualifications over time that are currently being consulted on by the UK Standing Committee for Quality Assessment. "It is essential that the public has full confidence in the value of a degree." Prof Jane Powell, vice-provost at Surrey University, said: "Our number of first-class degrees reflects a combination of factors, including major investments in high quality teaching, resources, and academic support. "This has seen us attract students with increasingly strong academic backgrounds and high levels of motivation to achieve excellent outcomes." In a statement, Coventry University said: "We've invested heavily in further enhancing teaching and learning and ensuring fast and good quality feedback, which is reflected in outstanding progress for the university between 2010-11 and 2016-17. This study does not take this progress into account. "We'd suggest our proportions of firsts and [upper seconds] are in line with our position in the UK rankings, recognising the great learning progress that our students make." "I sincerely hope today's figures act as a wake-up call to the sector - especially those universities which are now exposed as having significant unexplained increases. "Institutions should be accountable for maintaining the value of the degrees they award. "I am urging universities to tackle this serious issue and have asked the OfS to deal firmly with any institution found to be unreasonably inflating grades."